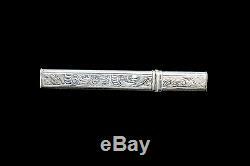 Antique Silver Dutch Needle Case. The Netherlands 1814 - 1906. Circa 9,6 cm long, weight 14 gram. An Antique Silver Dutch Needle Case, the front and backside professionally engraved with scrolling flowers and geometrical desig. Ns, the girdle with a cord design, circa 9,6 cm long marked twice with a sword for the Netherlands 1814 - 1906, maker's mark with W in octagonal shield, possible to use for needles, toothpicks or small pills. Extra photos of the object are possible upon request. You are also welcome to visit our shop in the center of Amsterdam, the Netherlands. The item "Antique Silver Dutch Needle Case, the Netherlands 1814 1906" is in sale since Sunday, August 13, 2017. This item is in the category "Antiques\Sewing (Pre-1930)\Needles & Cases".gans" and is located in Amsterdam. This item can be shipped to United States.